Teaching and Research Interests: He teaches comparative religion, theory, and methods in religious studies, Islamic studies, interfaith studies, and Malcolm and Martin. He directs the interdisciplinary minor in interfaith studies. His research interests are mainly in the area of Islam and Interfaith Studies. Shafiq creates a space at Nazareth where civil dialogue and religious discourse are not only fostered, but celebrated. Why is Interfaith and Religious Studies Important? "Interfaith dialogue is not just about faith: It is about race, gender, culture, and all other aspects of human life. Deep down, interfaith dialogue is to look after and nourish the whole of human life — spiritual and physical as well." Interfaith studies is growing as national attention on race, diversity, and civil rights has increased in recent years. Recently, Shafiq introduced a course called Globalization, Inclusivity and Dialogue that is taught at cultural sites across the Rochester area. The class includes visits to the National Susan B. Anthony Museum & House, Frederick Douglass’ grave, the Rochester Museum & Science Center, and more. "Experiential learning allows the students to step away from the books as we take them out of the classroom and expose them to people from different cultures, races, and ethnicities." At the end of the course, students create a video encapsulating their experience. Many students reflect on being shocked to discover just how diverse and culturally rich Rochester is. Originally from Pakistan, Shafiq emigrated to America in 1976. While studying at Temple University, Shafiq became fascinated by religious dialogue. "In those days, there was ecumenical dialogue not interfaith dialogue. Those who were Jewish, Muslim, Hindu, Buddhist, etc. were not part of the conversation. The term ‘interfaith dialogue’ wasn’t even coined until 1988, so the practice is still very much in its developmental stages." Realizing he could change this, Shafiq has written a variety of books while organizing scholarly conferences and offering workshops and training for teens, teachers, and trainers at Nazareth College’s Hickey Center for Interfaith Studies and Dialogue. "Nazareth College was the first college in America, maybe in the world, to establish a center for Interfaith Studies and Dialogue prior to 9/11," he believes. "On the first day, I tell my students to leave their bias baggage at the door and come inside the classroom with an open mind and critical thinking." During classroom discussions, Shafiq always encourages students to share their unique point of view while being respectful of other students. "The goal is to academically see two sides of the coin. We take students’ perspectives and make them into a discussion." His Interfaith Studies and World Religion course promotes empathy, respect, and tolerance. "We don’t change people’s way of believing. We change their behavior towards those with fundamentally different backgrounds than them. One of my students came to visit and brought her mother. The mother proceeded to thank me for opening her daughter’s eyes and giving her a new way of looking at the world. If you really want to know yourself and your environment, spend some time with us in interfaith studies." "Dr. Shafiq is genuinely one of the most thoughtful and considerate professors I have encountered at Nazareth. He shows respect and kindness to everyone around him, but also uses that towards his work for spreading interfaith awareness and coexistence to our community. His hard work at the interfaith center never goes unnoticed. Dr. Shafiq shows great understanding for the diversity in our community and inspires others to understand it as well." 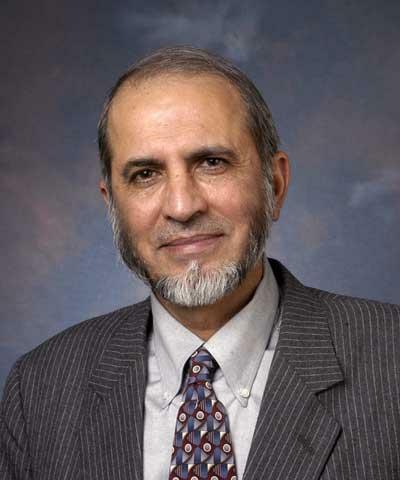 "Dr. Shafiq consistently challenged and supported me as a student, an organizer, and a practitioner of interfaith dialogue throughout my four years at Nazareth College. Within my first year as a student worker at the Hickey Center, I had mastered the art of event coordinating, advertising, and facilitating. While I was mostly successful in my work, mistakes were inevitable. These were met with nothing but care and guidance from Dr. Shafiq." "His perspective on conflict resolution is rooted in dialogue and understanding of the other side. Whether it be a conflict with catering, scheduling, or facilitators, Dr. Shafiq prioritized dialogue and appreciation for the other perspective, a technique that has followed me well after my time at the Hickey Center. Working with Dr. Shafiq in any capacity is a true privilege that should not be taken lightly! Shafiq started the Hickey Center for Interfaith Studies and Dialogue at Nazareth in 1999 because he saw the growing divide between people of different faiths and cultures. The Hickey Center's goal: Promote understanding and appreciating differences through education and dialogue. Of all the work the Hickey Center has done, Shafiq is most proud of the amount of the diversity it has brought to the Nazareth community. At the Global Citizenship Conference, Shafiq sat on a panel alongside students from different ethnicities and backgrounds. "It is important ... to have diversity, something I didn't have at my school," Shafiq says. "It is a blessing for me to see such diversity in our programs. There is a greater hope for me."